The Hon. Dorothy Pine-McLarty has been a member of the Board of the Jamaica National Building Society (JNBS) since September 1998. She has been a Director of JN Money Services Limited since that time and has held a number of other board positions within the Group. 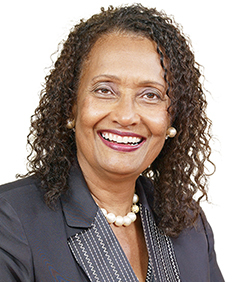 With the launch of JN Bank and the restructuring of the Society, Mrs McLarty was appointed to the boards of The Jamaica National Group and the JN Financial Group. She is also a member of the Proxy and Loan Committees of The Jamaica National Group. A practicing Attorney-at-law for some 50 years, she retired from partnership of Myers, Fletcher & Gordon, but remains a Consultant. She served as the head of that firm’s Property Department from 1992 to 1995 and was Managing Partner of the firm’s London office from its inception in 1995 until June 1998. She was also admitted as a Solicitor of the Supreme Court of the United Kingdom in 1995. Mrs. Pine-McLarty is chairperson of the Electoral Commission of Jamaica. She sits on the Board of Governors of the St. Andrew High School for Girls, and is on the finance committee of the University of Technology. Mrs. Pine-McLarty was awarded the Order of Jamaica in October 2007 for outstanding public service and received the Gleaner Company Honour Award for Public Service in 2016.